14th Annual Latino Youth Leadership Conference (LYLC), with nearly 2,000 participants, will be held at Emory for the third year in a row. More than 1,300 Latino teens from across the state will assemble at Emory University on Saturday, Nov. 9 for a day full of motivational speakers, workshops and activities geared to motivating students to go to college and pursue careers. Middle and high school students will be joined by parents, teachers and hundreds of volunteers for the Latin American Association’s (LAA) 14th Annual Latino Youth Leadership Conference, for a total of nearly 2,000 participants. "Latino students represent a significant and growing portion of the children, adolescents and young adults in our society who must be well-educated in order for us to meet the challenges of our future," says Vialla Hartfield-Mendez, director of engaged learning for the Center for Community Partnerships at Emory. 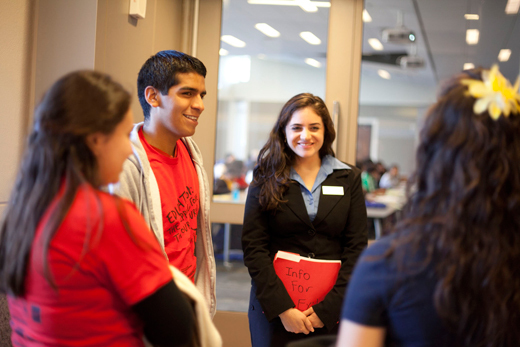 "The Latino Youth Leadership Conference is part of a larger effort at Emory and in Atlanta to better address the challenges of both immigration and education. We are delighted to partner closely with the Latin American Association again to host and help facilitate this conference." "
The conference, which will be held at Emory for the third consecutive year, is once again presented by AT&T. More than 90 schools from all over Georgia will be represented at the conference. The event will involve faculty, staff and students from across the University, including members of the Office of Community and Diversity, the Department of Spanish and Portuguese, the Center for Community Partnerships, and the Latino Student Organization. "The Latino Youth Leadership Conference is a powerful mix of culturally relevant motivational sessions and grade-specific information on colleges and careers that helps prepare Latino youth to reach their full potential," says LAA Executive Director Jeffrey Tapia. "It is important for Latino and Latina students to understand that they can go on to college and pursue meaningful careers. The majority of the students will be the first in their family to go to college." Though overall high school dropout rates have been declining, Latinos tend to drop out of high school at a higher rate than other groups. Nationally, the high school dropout rate among Latinos is 17 percent, nearly three times as high as it is among whites (6 percent) and nearly double the rate among blacks (9 percent), according to the Pew Research Center. The youth conference begins at 7 a.m. when hundreds of students will arrive by school bus at Emory’s Woodruff Physical Education Center. During opening ceremonies at 9 a.m., students will get a chance to listen to nationally renowned youth motivational speaker Gabe Salazar and Alicia Abella, assistant vice president of technical research at AT&T. Sonia Nazario, Pulitzer-prize winning journalist and author of the book "Enrique's Journey" will conduct several workshops, including one on how to write and tell one's own story. Middle and high school students will spend the day at workshops featuring topics such as how to apply for scholarships and financial aid; how to complete the college application; how to build your brand; and how to pursue careers in science. They will also attend a College and Career Fair, where colleges such as Georgia Tech and Georgia State, and organizations such as AT&T, Delta, GE, Univision 34 Atlanta and the Hispanic Scholarship Fund will have exhibits.